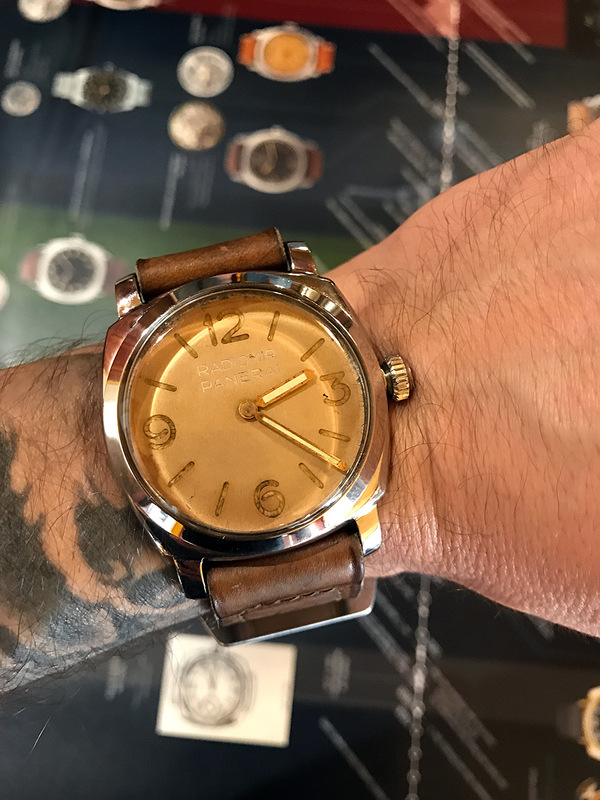 In-depth research on vintage Panerai and Rolex watches of reference 1665, 2533, 3646, 6152, 6154, 6152/1, GPF 2/56 with Rolex 618, Angelus 240 and Montilier 663 movements built from 1936 to 1965. 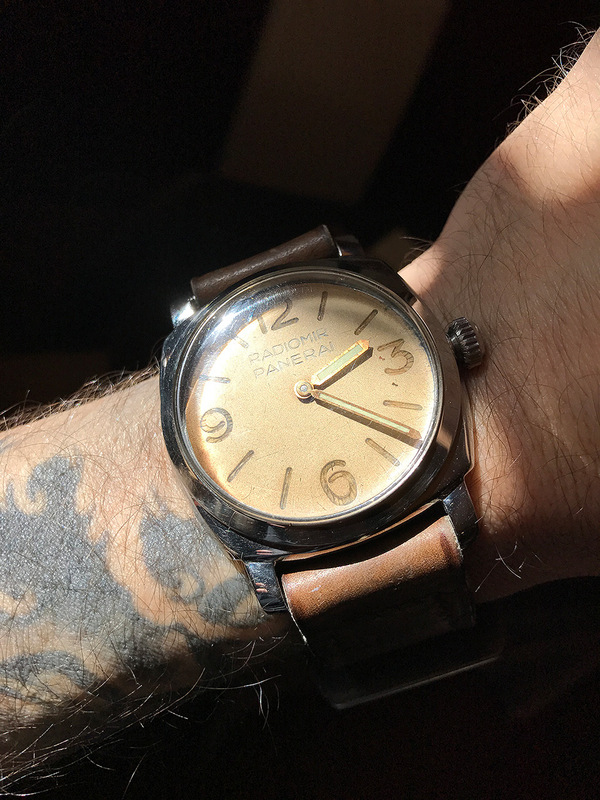 Readers of Perezcope.com are aware that I have been working on the print file of the first ever visual Panerai Timeline for quite some time. Plenty of test prints were necessary to reach the point where I was satisfied with the provided quality. My goal was to have the posters ready before my trip to Italy to attend the annual Club Panerai Meeting in Viareggio. I planned to make a limited edition of 50 pieces and have them signed in Florence by Maria Teresa Panerai, the widow of Giuseppe Panerai. Giuseppe Panerai was, together with Hans Wilsdorf (Founder of Rolex), the master mind behind the iconic Panerai watches. Everything worked out well and I travelled to Italy with three large containers full of posters. The size of the containers did not allow a normal check-in. Security scan for oversize baggage. Short stopover in Doha and continuation to Italy. Finally, arriving at the Coast of Tuscany. Piero Lapiana, the founder of Club Panerai surprised me with a visit of the COMSUBIN base in Le Grazie, Portovenere near La Spezia. This is the very place where the original Decima MAS was based. Piero Lapiana chatting with COMSUBIN personnel, whom are also Panerai enthusiasts. 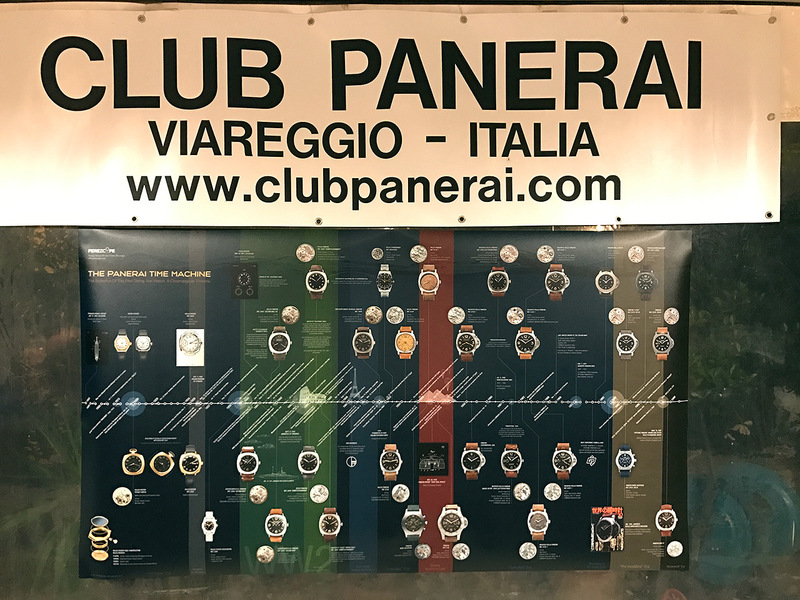 Piero’s website Club Panerai was the first Panerai enthusiast web network, established in the year 2000, even before Paneristi.com. Luigi Durand de la Penne’s 3646 in a display at COMSUBIN. A truly oustanding watch with an amazing craze on the crystal. Painting by Rudolf Claudus, portraying the Decima MAS attacks on Gibraltar. Cockpit of Teseo Tesei’s retrieved Maiale (Manned torpedo) of the failed attack on the British Naval Base in Gibraltar in October 1940. The compass has Radiomir lume and was made by G. Panerai & Figlio. Teseo Tesei and his partner had to abort the attack due to problems with the breathing apparatus. Instead of destroying the Maiale and risking to attract the attention of the Brits, Teseo decided to remove the explosive warhead and steer the SLC unmanned into the open sea. Teseo and his partner managed to reach the Spanish coast and returned to Italy. The Maiale however, made a turn and ended up at a beach near Gibraltar. The Spanish Guardia Civil found the vehicle with the propeller still spinning and made it disappear. The Spanish government returned the Maiale in 1975 to the Italian Marina Militare. Thank you very much for this fantastic present. I hope you like the Panerai poster and I am very honored and proud that it will be hanging at COMSUBIN soon. The next day in Florence. 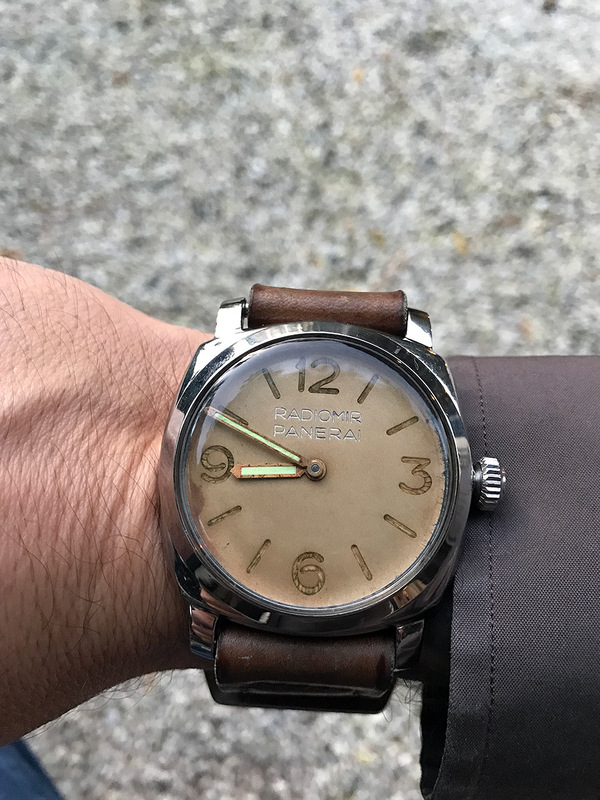 After meeting a fellow Panerai enthusiast near the Panerai Boutique at the Piazza San Giovanni near the Duomo, I drove to Piazza Galileo Ferraris to meet Signora Maria Teresa Panerai in her Villino Panerai. This is where you have to ring if you want to learn about Panerai. Maria Teresa Panerai welcomed me as usual upstairs in the living area of the Villino Panerai. To make the whole signing process more special, she suggested to sign the posters in Giuseppe Panerai’s very own laboratory on the ground level. Below you can see her signing the posters. Mrs. Panerai is an amazing person with a very sharp memory and jovial personality. It is always a pleasure to meet her in the Panerai epicenter and chat about history, her ingenious husband Giuseppe Panerai and her interesting life. We agreed to focus more on Giuseppe Panerai’s life in future, since he was the driving force behind every invention related to the Navy and the Panerai watches. A special dedication for a special person. Thank you very much Maria. I will soon be back to visit you again. On the way out I discovered this fantastic Longines calendar in Giuseppe Panerai’s laboratory. On Saturday morning, the Club Panerai organised a visit of the Marina Militare Museum at the Arsenale in La Spezia. 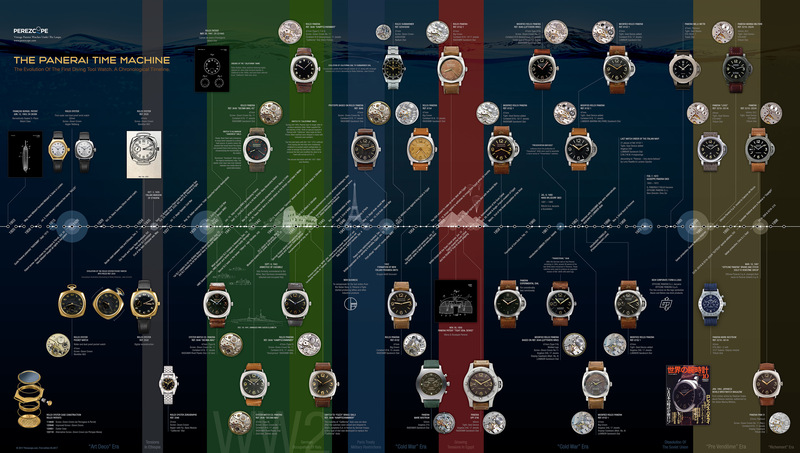 My poster with some amazing vintage Panerai watches. Carlo Ceppi (left), European Sales Director of Panerai, surprised us with his presence. Here he is taking pictures of the poster. Group photo in front of a Maiale (Manned torpedo) at the Arsenale in La Spezia. This type of container was used on Italian Submarines to transport the Maiales (SLCs) and deliver them to enemy harbours. The Italian Submarine Scirè with three SLC containers. Having an interesting conversation with Prof. Ugo Pancani and Carlo Ceppi about Panerai history and the future of the brand. During the following lunch at the Restaurant of the Marina Militare, we had the opportunity to see lots of watches. The watch below is a true time capsule. The owner, an Italian Incursore, died during an underwater exercise in the late 1950s. 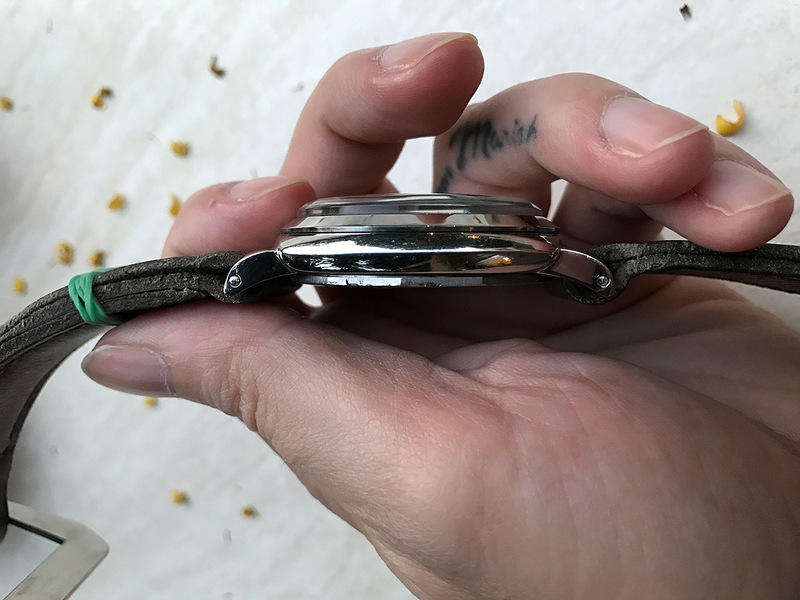 The sister stored the watch in a drawer, where it remained untouched for more than 50 years. I also got the chance to have a closer look at Ref. 6154. Whatever the true story behind this reference is, the watch itself is simply amazing. The dial changes its appearance depending on the light and has a metallic surface which is very difficult to capture. Look at this profile. Comparing this case to car design doesn’t do it justice. This is beyond human design, this is a true UFO. The Panerai Time Machine was part of the fantastic dinner we had that evening. No trip to Tuscany is complete without a visit of the mindblowing Panerai Museum of Signor Francensco Ferretti in Montecatini Terme. Inside the shop with great people. This trip was a terrific experience. Thanks to everyone, especially Piero Lapiana for organizing. Wonderful article! Thank you for all the pictures. Thank you for all your efforts and the beautiful pictures. Toller Bericht mit fantastischen Bildern. Vielen Dank Jose.